Can you imagine not being able to hear the alarm going off in the morning? Or not being to hear the door bell? Or the phone ringing? And not being able to have a conversation on the phone? And if you’re a mother, never to hear your baby’s cries or laughter nor their first words? Or a child not being able to hear if his or her parents are there at night. When they call out to their mum/dad, they do not know if they have responded. Deafness has a huge impact on people’s lives. They can feel disconnected from all those around them when they have difficulty interacting with people on a daily basis. They get left out of conversations or they may lose their job if deafness comes on in adulthood, and so lose friendships. This silence is not peaceful. It must be lonely and frightening at times. And frustrating. A few years ago when we went to Crufts, and cockapoos was a rarity then, we met several cockapoos – who were there with the Hearing Dogs charity. We were delighted to meet them and that was the first time we learnt about Hearing Dogs for Deaf People charity. Apparently the breeds usually used for Hearing dogs are – miniature Poodles, Cocker Spaniels, Labrador and Cockapoos! What an honour to be be selected as a breed appropriate for such an important task. We’ve been learning more about how they are trained through the Hearing Dogs Charity. Training the selected dogs from birth takes a long while. 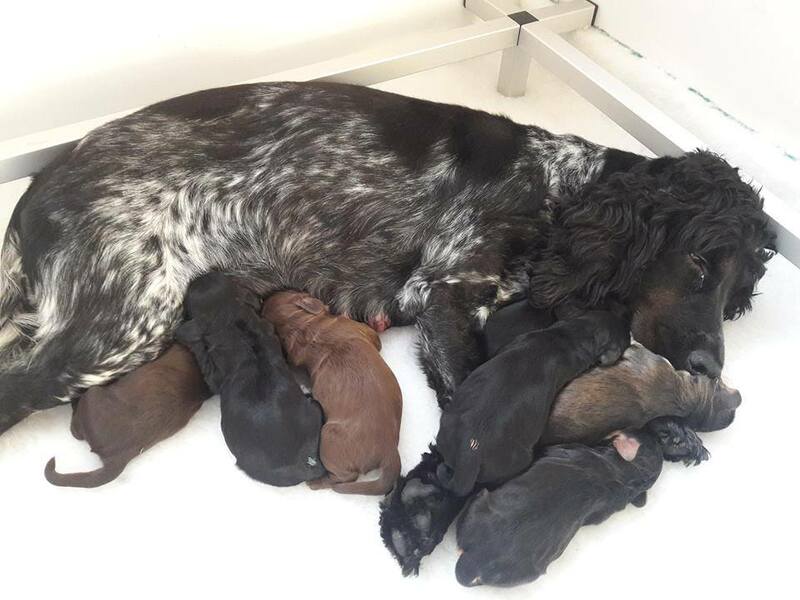 When they have been bred to be hearing dogs, after eight weeks from birth, they leave their mum and siblings. They are taken to be socialised where they meet their puppy socialising volunteer who will teach them the basics of sit, down, settle. The puppies stay with their volunteer from eight weeks till about 16 months where they continue with training classes and are awarded puppy stars for each stage. They would be health checked and any issues they may have would be noted. These dogs attend training in a purpose-built house where they are exposed to noises and sights that they will encounter every day. At age 16 months they progress to advanced sound work. This covers things like alerting human partner to telephone, doorbell, microwave pinger, when someone talks to their human partner and potentially life-saving noises like smoke or fire alarms. There is a lot to ask of them. When they are on duty they have to not only keep their human safe, but be rock solid in their behaviour. They must be safe around little kids, other dogs, able to lie quietly in a hospital waiting room, resist scavenging for bits dropped while their human is in a restaurant having dinner (that counts me out! ), or barking just because the train makes a funny noise. As training progresses they are matched with a potential human partner. This assessment is done on an individual basis to ensure a good partnership – and whose life they will potentially change. When the ideal match is made the final training is done specifically to meet the deaf person’s needs. This can be anything from increasing on road training for the daily walk to work, increasing time on public transport, riding in lifts, or working with a child recipient so the dog is happy dealing with school playtime, being quiet in class. Once a Deaf person has been given a Hearing Dog, they are guaranteed to have one throughout their lifetime. Hearing dogs retire at about 11 years of age. It takes time, dedication and money before a Deaf person can benefit from a Hearing Dog. 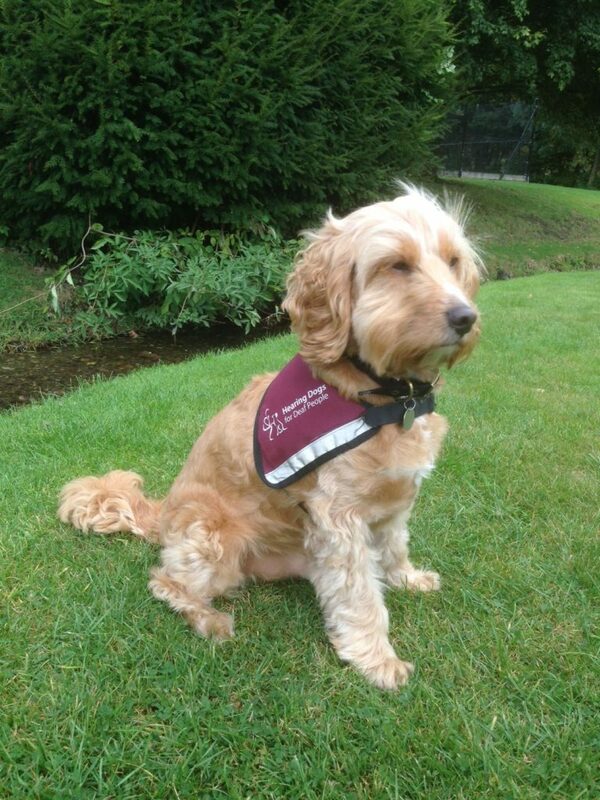 They cannot be classed as a Hearing Dog until they have passed all their Accreditation. The total costs to support dog/human partnership from birth throughout life PER DOG is about £40,000. Sounds like a lot of money but they change lives. It means deaf children who get very scared or anxious when they can’t hear their mum/dad in the house can wake up to a wagging tail. That is priceless! Since the charity began in 1982, they have placed over 900 hearing dog partnerships across the UK. 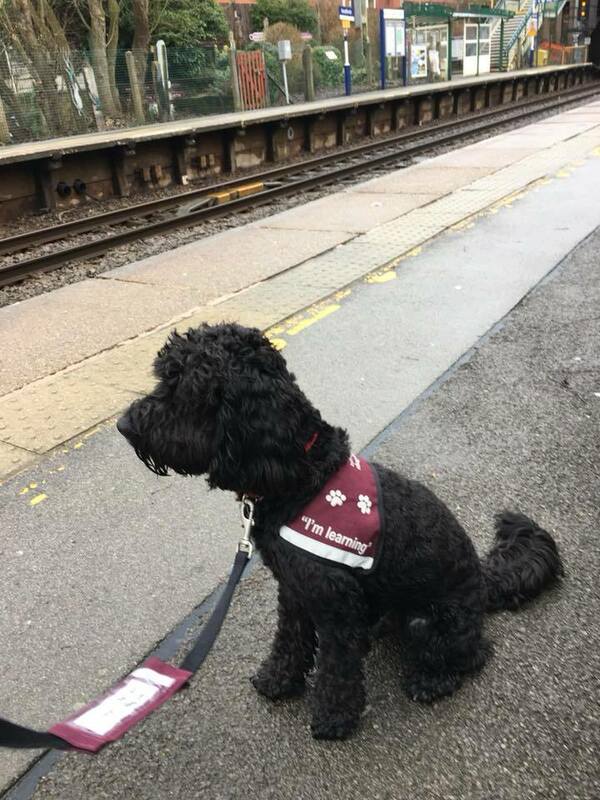 The reason for this blog post is to help raise money for the Hearing Dog charity. Friends of ours, Diana, Mary and Jane who all have cockapoos have collaborated on this book – Cockapoo World – a complete owners guide to cockapoo care and management – which provides information, support and advice to anyone who owns a cockapoo, or who is interested in owning one. All proceeds of sales goes towards the charity. We are so proud that cockapoos are not just cute and fluffy teddy bears but that we are a part of this select breed of dogs that can help change people’s lives. 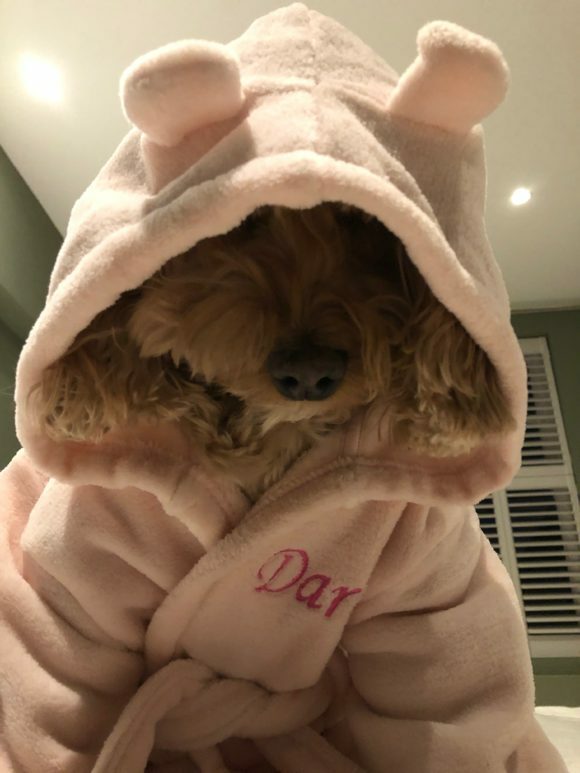 May’s comment: Written by Diana Hoskins, the purpose of which is to provide information, support and advice to anyone who owns a cockapoo, or who is interested in owning one. The second is to support and raise money for the UK charity – Hearing Dogs for Deaf People which was established in 1982. They train Assistance dogs for both adults and children who are deaf. The publication of this book combined the aims of those two goals. You can buy this book on Amazon. All profits from the sale of this book will be donated to the charity via the British Cockapoo Society’s Just Giving page. We try to support this charity as much as we can. Seeing the work these inspirational dogs are trained to do is amazing! Of course we’ve purchased this book. 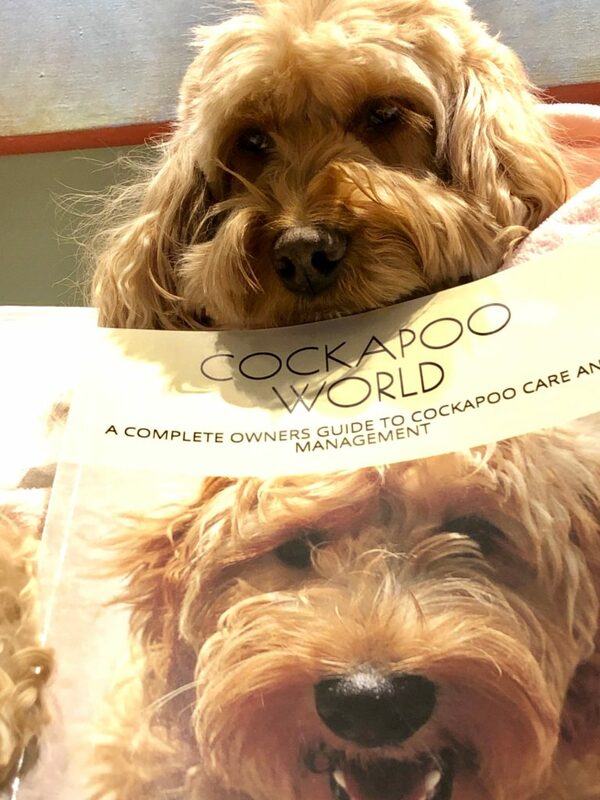 It’s an informative read even for a seasoned Cockapoo owner! Thanks Miss Darcy and May for bringing the charity to the attention of your readers. Thanks Alison. The things dogs do for humans – they deserves to be regarded better.